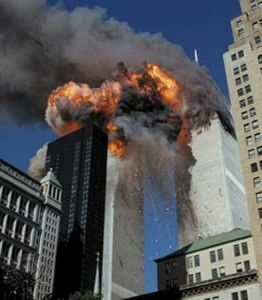 This piece is included in 09/11 8:48 AM: Documenting America’s Greatest Tragedy, an anthology of raw, immediate accounts published across the nation after the tragedy of 9/11, edited by Ethan Casey with the New York University School of Journalism. It first appeared in The Daily Tribune (Royal Oak, MI). A little more than a week has passed since our country was attacked and brought to its knees. A friend of mine says she is trying to wake up from what she calls Stephen Kings worst nightmare. The rest of us still feel as though weve been wandering in a fog, unable to find our way home. Home, it seems, has been completely redesigned by horrific acts of terrorism. Ever since last Tuesday, everything is different. Everything. I have stopped assuming that home will ever be completely safe from disaster. This thought alone makes every wall, every window, every piece of oak, maple, brick, or concrete in my neighborhood, my world, seem all the more precious. Ive stopped obsessing over the things I used to obsess about. Ive stopped worrying about the fact that my refrigerator needs cleaning and the walls in the kitchen need repainting. Things like that dont matter now. My focus has changed. It doesnt matter if my family leaves a mess on the breakfast counter every morning. And so what if I trip over somebodys shoes in the hallway? I am deeply grateful that there are people living here — eating breakfast and wearing shoes. I imagine this is all part of the grieving process, and that someday things will seem normal again. Right now, though, I feel a bit like Emily in Thornton Wilders Our Town. Emily is the character who, near the end of the play, returns to her hometown as a ghost and realizes how much she took for granted when she was alive. Emily recites a list of the simple things that made her days precious — things like the smell of freshly brewed coffee in the morning. I know exactly what she meant. This week Im savoring the taste of summers last tomatoes. Im taking time to watch the sun set behind the maples in our yard, and to listen to the sound of cathedral bells just a few blocks away. But I cant think of anyone who is appreciating the comforts of home as much as Norma Gormly of Troy, Michigan. Normas plane was diverted back to Londons Gatwick Airport immediately following the terrorist attacks on the World Trade Center and the Pentagon. Norma and her daughter, Jan, had been on vacation and ended up stranded at a bed-and-breakfast inn outside London until the airways were cleared for their return to the United States. Theirs was the first Northwest flight to leave last Friday. As Norma told me, it was quite an experience. None of the passengers complained, though, even though their wait was long. Another three hours passed before their flight left Gatwick. Norma and her fellow passengers clapped and cheered loudly as their plane finally took off. They cheered again when the plane passed over Canada. And it was, as Norma remembers, a tremendous relief to arrive back home in America. This entry was posted in Columns & essays and tagged 09/11 8:48 AM: Documenting America's Greatest Tragedy: Eyewitness Stories and Thoughts from Ground Zero in the Attack on America, 9/11 writings, commemorating 9/11, Detroit journalists, essays on home and family, Ethan Casey, inspirational essays, New York University School of Journalism, newspaper columns on 9/11, Writing Home by Cindy La Ferle. Bookmark the permalink. Such a moving and understated essay, Cindy. You really hit how so many of use were feeling and still are…and just having traveled on 4 planes in 5 days, I still don’t mind all the extra hassle. It’s worth it. Beautifully told Cindy. It is a day and an experience none of us will ever forget. Spoken from the heart – thank you Cindy. I can so relate to everything you said – especially cherishing each precious moment – time spent with family, friends, my kitty children. Kiss my husband goodbye whenever he leaves the house, because you …never know if it will be the last time. I vividly remember 9/11 and how I initially thought it was a movie until I heard Katie Couric’s panicked voice reporting on the news as it unfolded before my very eyes. Unbelievable! I’ve been haunted by the events of that day as you and so many of us are. Yesterday was very somber – it rained all day here – I felt as if the rain represented the tears of those who died and those left behind. So very sad. Yet hope springs eternal and thanks to stories like yours, we are reminded that we must seize the day, and recognize and revel in the sacredness of each moment we are gifted with. P.S. Posted this to your Facebook site too. Thank you — I appreciate these nice comments on the essay. It was written just a couple of days after 9/11, because it had to be turned in several days before publication in the Sunday edition of the newspaper. I remember crying as I rushed to finish the piece to meet my column deadline. I was emotionally wrung out. So the piece really was “a raw and immediate” reaction to the tragedy — which was one of the requirements for the anthology. In retrospect, I know that the piece would have been different had I written it even two weeks later.